Most people truly want to eat more healthily. And most companies want to provide healthy foods to their customers. The problem, however, is that healthy foods tend to lack the salt, fat, sugar, and carbohydrates that people crave. So, even while people try to eat healthily, they soon tire of the high-fiber, low-fat foods that they should be eating, and reach for more appetizing alternatives. Hence the boom in snack food that makes at least some concessions to health. Supermarket shelves are filled with products that advertise that they contain healthy vegetables or high-protein grains. But how healthy are these foods, really? Here’s a breakdown of how some of the most popular “healthy” snacks stack up. They’re veggies, right? That must mean they’re healthy! Well, that depends on the product. With just a few exceptions, many of the most common veggie snack products have similar nutrition profiles to potato chips, with primary ingredients of potato flour and potato starch. Many of these potato-heavy healthy snacks indeed have lower fat and calories than standard potato chips, but they don’t have any of the vitamins or nutrients that real vegetables provide. Veggie chips made from whole dehydrated vegetables are likely to have more of the good vitamins and nutrients, but they are also likely to have more fat and salt to make them more palatable. Bottom line? Read the label to find out what you’re really eating. Quinoa is a popular superfood because of its relatively high protein content, and people are drawn to quinoa chips for the same reason: they hope the protein will stave off hunger and help them eat less. Indeed, some quinoa chips have as much as nine grams of protein and as little as 12 grams of carbohydrates (compare to two grams of protein and 16 grams of carbohydrates in a serving of regular potato chips). Other quinoa chips, however, have as little as 1 gram of protein. If protein is your primary goal in a snack food, quinoa chips may be a good choice, but make sure to check the nutrition information before diving in. Pita chips have a good reputation; they’re often served with hummus (often a healthy snack choice), and they seem like they should be healthier than potato chips. However, most pita chips are made with processed white flour pita bread, which is high on empty carbohydrate calories and low on fiber, protein, and any healthy nutrients. Many pita chips are soaked in oil before baking, and then coated with salt—giving them a very unhealthy nutrition profile that’s high in carbs, sodium, and fat: a trifecta of bad nutrition. Not all pita chips fit this mold; look for whole grain chips with less than three grams of fat and more than two grams of protein. 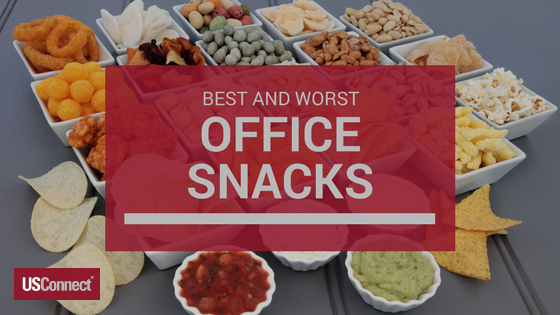 What Are the Best and Worst Snacks for the Office? In the nutrition community, “snacking” used to be a dirty word: a bad habit that many clients needed to break. Today, the jury is still out on whether eating many smaller meals a day is better or worse than eating three larger ones. However, as with most nutrition “rules,” what you eat is more important than when you eat. When in doubt, read the nutrition label and look for foods that give you good nutritional balance. Aim for more foods that are high in protein and fiber and fewer foods that are high in fat, salt, and sugar. And always look for the apple logo indicating The Right Choice… for a Healthier You® option. Full Speed Ahead: eat these snacks without guilt! Reduced fat cheese provides an important protein boost, as well as calcium and often vitamin D.
Hummus (bean dip) with veggies like carrots and peppers contains fiber and protein, and the veggies provide beta-carotene. Berries contain health-boosting anti-oxidants along with a burst of energy from natural sugars. Nonfat Greek yogurt packs a protein punch and helps your gut with healthy probiotics. Nonfat cottage cheese is low in calories but high in protein and calcium. Proceed with Caution: these snacks are fine in moderation, but don’t overdo it. Nuts have a high fat content, but it’s “good fat,” and the protein gives a good boost to get you through the day. Look for nuts (like pistachios) that are still in the shell ; this will help prevent mindless eating. Dried fruit can be a delicious alternative to candy, but it can still contain more sugar than you want to consume during the day. Make sure to check the sugar content on the nutrition label, as all dried fruits are not created equal! Popcorn is a whole grain, making it better for you than snacks made with refined white flour. Some snack popcorns are also low-fat and low-salt, making them a relatively healthy snack. However, make sure to watch your portion control, and check the label to make sure that the fat and salt levels aren’t too high. Roadblock: avoid these snacks when possible. Potato and corn chips usually get their delicious addictiveness from the fat and salt they contain. If you must indulge, look for baked varieties and those with reduced sodium. The intrinsic portion control from vending machine snack bags can help you enjoy these treats in moderation. Sugary candy offers no nutritional benefits: just a quick burst of energy followed by a sugar crash. Dark chocolate can give you that sugar with some additional anti-oxidants to books your health. Just in time for spring, USConnect is pleased to announce our quarterly specials. All the items listed below are buy four, get the fifth free when you use your USConnect OneCard or the USConnectMe app. Remember, card holders earn 5 reward points for every dollar spent, and redeem online for cash back on your account. You’ll earn up to 2.5% back every day! Your rewards also give back: at participating locations, 1.5% of every dollar spent on your OneCard or the USConnectMe app goes to the charity of your choice. Now that’s truly rewarding! If you’re not already signed up for USConnectMe, register here. If you haven’t already downloaded the USConnectMe app, do it today at the Apple Store or Google Play Store. Introducing a new feature on the USConnect blog: battle of the ingredients! At USConnect, we know you care about your health, so we help you make The Right Choice for a Healthier You™. That’s why we’ll periodically compare common ingredients of foods and discuss the pros and cons of each. Easter is right around the corner, and with it comes an onslaught of chocolate eggs, bunnies, and other shapes. So, if you’re going to indulge this Easter, which chocolate is better: milk or dark? To begin, it helps to know how chocolate is made. All chocolate (dark, milk, and white) starts with cocoa (cacao) beans with varying amounts of sugar, cocoa butter, and sometimes milk or vanilla. The type of chocolate depends on the percentage of cocoa in the mix, with dark chocolate usually having at least 70 percent, milk chocolate having no more than 50 percent, and white chocolate having less than 35 percent. Let’s start with milk chocolate, which has traditionally been the most popular among American consumers. Milk chocolate, as its name suggests, contains milk, which gives it more calcium than dark chocolate (8 percent compared to 3 percent). Milk chocolate is also slightly lower in calories, fat, and saturated fat than dark chocolate. However, milk chocolate also contains significantly more sugar: 21 grams as opposed to 10 grams in dark chocolate. It also has higher cholesterol than milk chocolate. Dark chocolate has more of almost everything than milk chocolate. As mentioned above, it has slightly more calories, fat, and saturated fat. More importantly, however, the higher cocoa content gives it more good stuff too: healthy monounsaturated fatty acids, fiber, iron, magnesium, phosphorus, potassium, and zinc. It also contains high levels of theobromine, which may help to lower blood pressure. Scientists have been touting the benefits of dark chocolate for years, and now you know why. Bottom line: no one would recommend an all-chocolate diet (although it would be delicious), but if you’re going to indulge, go for dark chocolate every time. Bonus: how does white chocolate stack up? Since the primary benefits of chocolate come from cocoa, white chocolate is the least healthy of the three. Avoid—if possible. Employee retention, especially in quick-turnover fields like information technology, is a perpetual problem for employers. How can companies keep their most valuable resources —their employees—happy? It turns out that the answer is simple: offer them free snacks. A recent survey by ORC International for Peapod (a grocery delivery service) found that 66 percent of employees in companies with “nicely stocked” kitchens rate themselves as “very happy” or “extremely happy” in their jobs. Of those who do not have this perk, 40 percent admit to being envious of friends who work for companies that do. Millennials (adults ages 18 to 34), in particular, seek this kind of workplace benefit; 66 percent say they would leave their current company for one that offered perks like snacks. Further, millennials were more than three times more likely to care about the availability of free office snacks than their colleagues who were over age 45. Peapod’s experience echoes wider trends governing healthy eating. Indeed, 83 percent of ORC’s survey participants said that having fresh and healthy snacks available is a “huge perk.” Since more than 56 percent of respondents agreed with the statement, “I hit an afternoon slump if I don’t have any snacks to refuel my energy,” it makes sense that employers would embrace this relatively low-cost way of increasing both productivity and employee loyalty. With USConnect’s wireless integrated food service network, providing employees with the healthy snacks they want could be easier than ever. By issuing employees pre-loaded payment cards, they can choose the snacks they want at the times they want them. Keep the millennials happy, and the rest will come! The food and foodservice industries are like cruise ships; they’re huge, and they turn very slowly. Unlike fashion trends, which change with each season, food trends change slowly over time, with new products gaining a niche market before expanding more broadly. That being said, this fall’s food trends follow the large-scale shift that we’ve been experiencing for the past few years: a focus on healthier food and a willingness to pay more for it. In fact, the 2015 Nielsen Global Health and Wellness Survey indicates that 90 percent of 30,000 respondents are willing to pay more for healthier food. Organic food sales have tripled in the past decade and continue to rise, and consumers are looking more closely than ever at their food’s labels to get a clearer sense of what they’re putting into their bodies. This fall, we’re seeing the healthy food trend continue, with many traditionally unhealthy foods trying to clean up their acts. Competing with candy bars, dark chocolate-covered fruit and nuts are gaining popularity due to the anti-oxidants in dark chocolate and the vitamins and nutrients in fruits and nuts. Gummy fruit candy is now available with 20 grams of whey protein. Consumers are keeping an eye on what they eat, and they’re more likely than ever to want clear, readable labels. The “clean label” movement focuses on ingredient lists that sound like consumers could find them in their own kitchens. The movement has even spawned its own conference and a growing consulting industry! Businesses are also increasingly “freeing” their foods of ingredients that consumers view as being undesirable; thus, look for more products bearing “gluten-free,” “GMO-free,” “nut-free,” or other “-free” labels. The market for local food also continues to grow, with more consumers than ever being willing to pay more for locally source food or ingredients. Local sourcing can be a headache for companies, and many are responding with a mix of local and regional ingredients. This increases the freshness of the food, supports the local economy, and reduces the environmental impact of the supply chain: all factors that influence consumer purchasing. The weather’s finally starting to cool down, which means that hiking season is here! For at least the past century, trail mix has been a preferred snack for hikers; it’s easily portable, lightweight, and doesn’t need to be refrigerated. With the right ingredients, it provides sugar for a quick burst of energy as well as protein for more sustained efforts: factors that also make it a great snack for work. As with most foods, however, it’s important to check the nutritional information on prepared trail mixes before assuming that they’re all healthy; some of them are so loaded with sugar, fat, and salt that they should be treated like a dessert or special treat, not a healthy snack. One way to avoid confusion about trail mixes is to make your own. You can craft it to meet your own specific tastes and be sure to avoid any surprises in the fat, sugar, and salt departments. Here’s a handy guide on making your own trail mix. Go crazy: add protein with nuts, legumes, and seeds. Go slower: add sugar and fiber with dried fruit. Last month, team members of USConnect went to the annual conference of the National Automatic Merchandising Association (NAMA) to learn about best practices and trends for 2015 and beyond. 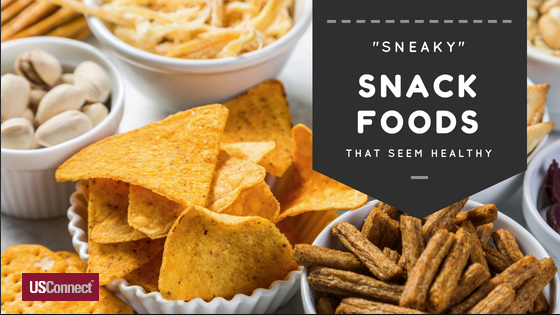 Here, we’ll share with you some of what we learned about snacking. To start, the term “snack” is very vague and getting vaguer. In previous decades, the word “snack” had a fairly concrete denotation; a snack food was potato chips, nuts, or maybe a candy bar. Today, however, a snack can be virtually any kind of food. One study found that while chips/pretzels/salty crackers were consumed 20 percent of the time, sweet baked goods (like doughnuts or Danish) were consumed 18 percent of the time, and burgers and frozen treats were each consumed 17 percent of the time. Fifty-nine percent of snacks eaten away from home are sweet, and 63 percent are salty. Americans snack two to three times a day. Women are starting to snack more than men. People mainly consume snacks between lunch and dinner or after dinner. Forty-five percent of people replace one or two meals with snacks. The traditional meal structure (breakfast with a mid-morning snack, lunch with a mid-afternoon snack, and dinner)is increasingly uncommon. People are replacing it with a much more fluid, responsible schedule. Attitudes toward snacking have changed considerably since the 1980s, when 70 percent of people avoided snacks entirely. Now 91 percent of adults snack at least once a day. By 2015, nearly 30 percent of consumers will average three to four snacks per day. People snack for a variety of reasons, including hunger, convenience, and managing diets to avoid overeating at mealtime. Snackers today buy an average of nine snacks a week. Twenty-six percent of people are eating more snacks than a year ago, and 34 percent are spending more on snacks. Seventy-one percent of people are trying new snacks. Seventy-six percent of people eat on-the-go meals. Once relegated to the junk-food aisle due to their high calorie count and excess sodium, nuts have made a comeback in recent years as researchers have shown their numerous health benefits. Although nuts indeed have a high fat content—up to 80% fat, in fact—the polyunsaturated and monounsaturated fat is considered “good” fat; it reduces the low-density lipoprotein (LDL) cholesterol in people’s blood, reducing their risk of heart disease. The American Heart Association recommends eating nuts—a small handful a day—as part of a heart-healthy diet. In addition to LDL-lowering fats, nuts are also high in fiber, vitamin E, omega-3 fatty acids, and plant sterols, all of which are associated with lowered cholesterol and improved heart health. Compared to many snack foods, nuts also have a lot of protein, which can help keep you going during the day. Their small size and portability make them a perfect snack for health-conscious eaters, and they are readily available in many Bistro To Go™ locations. Of course, as is the case with most foods, portion control is crucial for keeping nuts healthy. A serving size is no more than a small handful: about 2/3 of an ounce to an ounce. With the amount of calories and fat that nuts contain—even though it’s good fat—overindulging in nuts is bad for both the heart and the waistline. How nuts are prepared also has an impact on fat content. When possible, look for dry-roasted or raw nuts rather than ones that have been roasted in oil. Additionally, it’s important to be aware of sodium; many roasted nuts are heavily salted, resulting in unhealthy amounts of sodium. *Peanuts are legumes, not nuts, but we’ve included them on this chart for convenience and for comparison’s sake. Do You Know Your State Snack? What can you do with this seemingly useless information? Make at-work dining more fun by challenging your co-workers to a scavenger hunt; see who can find the most state foods during the course of a week! Yogurt (New York) is always easy to find at our Bistro To Go™ kiosks, and do any of our fruit drinks contain chokecherry (North Dakota)? How about a nice Cobb salad with avocado (California) or a golden delicious apple as a snack (West Virginia)? Don’t go too heavy on the Boston cream doughnut (Massachusetts) as you eat your way around the country at work!